What would happen if you didn’t eat meat for a long time and then started eating it regularly again? I’m not talking about taking a bite of chicken, I’m talking eating it day in and day out. This was a question I thought I’d never personally get an answer to within my own experience when I chose to stop eating meat nine years ago. I encourage you to read this whole story, as it’s important given how many people I see experiencing exactly what I experienced. I ended up stopping the consumption of meat after 30 days and I’m glad I did. You’ll see why. First a little history. I grew up eating a diet that would be considered pretty healthy by Western standards. I rarely ate fast food, 90% of my meals were home cooked, and my mom had a good sense of how to balance a meal in ways many would consider fabulous — small portions of meat with a grain and veggies. Every meal had veggies. We ate things like pasta, chicken with broccoli and rice, lasagna, homemade burgers, and other simple foods without a ton of processing. I ate almost any type of vegetable you can think of and fruit as well. By far, my and my family’s worst habit was having a Coca-Cola at dinner. I share this because many people might feel I ended up the way I did, with digestive issues, because I ate a ton of junk my whole life. But I didn’t, and that’s an important note. It’s also an important note that I didn’t have consistent and obvious problems with dairy or wheat my whole life; rather, they slowly built up over time. So what happened to me? I was gassy all the time. Not just farting, but burping constantly. My burps came after every meal and would last for hours. To me this was normal, and I saw so many people around me doing the exact same thing that I was sure this was just how it was supposed to go. Farting, burping, bloating — I thought it was just a factor of eating. Heck, everyone makes jokes about how often people fart and burp so I thought it was normal to do it daily. I also noticed I was getting tired a lot, but then again I thought that was normal, too. Coming home after school or work and wanting to have a quick nap or wanting to sleep after meals, I watched as everyone around me was doing the same thing, so again, I thought this was normal. As I made my way to my twenties, I started to notice it all got worse. Finally around 20 or 21, it was hitting a wall. I would literally get bloated from dairy, meat, wheat, fruit, veggies, EVERYTHING. When I would eat things like dairy, meat, or bread, I definitely felt much worse, but everything was truly an issue. But again, as I would talk to people, other than when I had my burping fits and stomach pain from bread, everything seemed normal compared to what everyone else felt too. Deep down I knew this wasn’t right. Feeling this way, seeing everyone feel this way, it didn’t make sense to me. In my experience, it took having these strong stomach pains and burping fits to finally do something, but for many, it’s still seen as completely normal, and as I cut all these things out of my diet, I watched myself change and could see the insane difference between my previous life and my new one — including when I compared myself to how others were feeling eating my old diet. I cut out meat, dairy, bread, even things like legumes for a while. I mainly focused on a whole food, plant-based diet. Every now and then over the first couple years I ate eggs and had fish maybe one or two times a month, but for long stretches I ate neither. I saw a HUGE difference in my digestion, energy, consciousness, clarity, mental ability, intuition, and athletic ability. They all increased dramatically as I continued. But something still wasn’t quite right, and after five years, I decided to find out what it was. I started to notice that when I ate a lot of food, for example a cup of rice, a good amount of tempeh, steamed kale, and maybe some potatoes, I would get bloated and tired. Maybe this is normal to some extent, but to be honest, it wasn’t even as much food as most would consider a lot. My daily caloric intake was only at about 2,300-2,400 calories and I was working out almost every day. Regardless, I could see my body wasn’t digesting certain food combos well or even certain foods in general. Not only that, but some things would sit in my stomach and eventually make me quite gassy, so I began going through many different options to find out how to stop the bloating. Intermittent fasting, cutting out carbs, not mixing fats and fruit, eating small meals, using digestive enzymes, using probiotics — you name it, I likely did it. I did this for nearly two years. 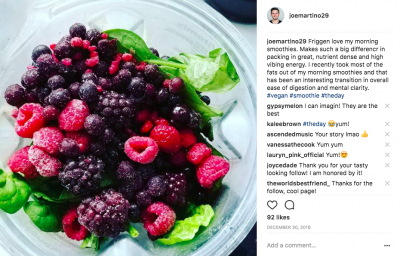 At a very frustrated and hopeless point, I eventually I found myself in front of a health practitioner who also had a ton of digestive issues, telling me to try something similar to a paleo diet, as that’s what she was doing. Of course, I was hesitant, since it didn’t feel like the right fit for me and I was sure it would cause a ton of issues. I intuitively knew it wasn’t going to work and I had done all the research to prove it, but some part of me still felt called to do it anyway. After weeks of debate, I eventually decided to try what she recommended. I learned a lot in the process. I knew this wasn’t a longterm solution, but was willing to entertain the idea that somehow, maybe one of the things that had gotten me sick in the first place might help heal me now. I set out to try this for a few months, with an open mind, and see what would happen. So after six years of no meat, I began having some chicken every other day and bone broth pretty well every day. At first I thought I might have an issue with digestive enzymes, as I’ve heard many times before that if you stop eating meat, you can’t digest it well if you start again. But I had never done the research on this. The truth is, thus far, the scientific perspectives are quite mixed and few proper studies have been done. The prevailing wisdom seems to be that enzymes used to break down fat and protein don’t differentiate between sources. Thus, enzymes needed for plant proteins versus meat proteins are the same. Some say you may need a few specific ones for meat, but they would return to the body in a matter of days after going back to eating meat. 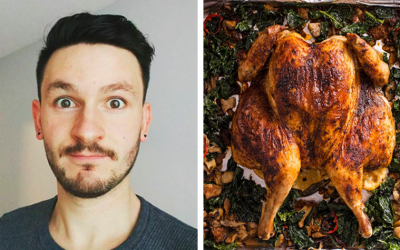 During this meat eating experiment I had organic, ethically raised chicken (or as ethical as you can get when you are using animals for food), I kept my meals insanely simple, and I cut my caloric intake to about 2,000 calories. A meal might look like a plate of steamed broccoli or kale and some chicken. I had smoothies in the morning that contained between two and four ingredients, with no heavy fat. I consumed no dairy. I also cut out gluten completely. So this really should address my digestive issues, as I had very little irritants or inflammatory foods (other than the meat) and I wasn’t eating much to tax my system. I was also intermittent fasting. So here’s what happened. Firstly, I’m sharing my story because I want to tackle a deeper side to meat eating that is spoken about less and that I believe carries importance. I knew From all my previous research and feelings that this was what was going to happen, but like I mentioned before… I was open to try. From a health perspective, it’s quite obvious by now, providing you are eating a proper diet that does not contain low quality processed foods, that the less meat you eat, the better your health. When it comes to dairy, avoid it, it’s scary. But I also reaffirmed a few things for myself during this experiment. I’m not saying everyone will experience what I’m going to cover below, but it’s what I experienced. We all have to focus on what’s right for us, but I believe we have to be willing to actually figure that out, beyond what our ego wants to identify with or do. Digestion Improved: Although not perfect, my digestion did start to improve. I felt like things didn’t sit forever and my energy wasn’t being spent trying to digest all the time. Was I getting more nutrient uptake? Tough to say, but if I had to guess, maybe a little. Less Bloating: Because I was eating much less and eating simpler, I wasn’t as bloated. This was a nice feeling for me. Even though I did bloat a little still, it was an improvement for sure. Less Gas: Because my digestion was working better and there was less confusion in there, my gas slowed down. But, when I did have it, the smell was worse before. Regardless, this was still a welcome improvement. Sleep Improved: Going back to digestion again, because my body was having an easier time with things, it wasn’t spending energy at night trying to digest. So I slept better. Again, a welcome improvement, because sleep was tough to come by at times. Aggression, Anger, Irritability: Ask anyone around me — I’m not aggressive, I don’t get angry, and it’s very difficult to irritate me. But after 7-10 days of eating meat again, I started to experience these things. This was where things got very interesting to me, as it had been so long that I had forgotten the energetic and personality type changes that come with eating foods like this. To preface this a little more, I meditate a lot and have spent a lot of time practicing presence. With this I’ve built a pretty good muscle for sensing energetic changes in my body and being. Noticing how the energy of meat, even good quality meat, was changing these parts of me was fascinating. It also helped me understand others better too, as I could relate again to what they go through and feel with their diet. Brain Clarity: I wasn’t sure what to call this one. It wasn’t that I had brain fog per se, but my sharpness and quickness in thought and creativity weren’t as strong. I was used to feeling pretty light in my mind. Except for when I ate too much bread or was in a really bad bloating fit, my mind was very sharp and clear on a plant-based diet. So this was a noticeable change. Density: Again, I wasn’t sure what to call this one, but my energy was different. I felt slower, heavier, denser. This might be hard to explain or relate to without a clear reference point (i.e. six years of a plant-based diet), but simply put, my energy not the same. If you have ever fasted for long periods of time and felt the shift in consciousness that comes from that, this was like noticing the same, only on the opposite side. Less Deep Meditation: Perhaps relating to the previous one about density, I noticed that my meditations were not quite as deep. Once again, I’m not sure how to describe this, as it’s very experiential, but there are obvious energetic changes that take place when you change aspects of your diet. This was a noticeable change in frequency that, in my experience, changed the depth and clarity of my meditations. Summary: At the end of the month experiment, I had not seen enough of a physical improvement to continue. My bloating began to increase again and my discomfort was still there. I was noticing other changes, like those mentioned above, that I really wasn’t enjoying, so it became clear to me that I wanted to stop. But I was still left with digestion that wasn’t where I wanted it to be. That’s when I tried one more thing… that worked. I attended a sweat lodge ceremony held by a friend of mine a few weeks after this experiment, and during the sweat, I set one of my main intentions to be getting over my digestive issues. During the second round of the sweat, a ton of clarity began to come through about old worries and fears of my past, including some present ones that were held in my stomach. As I began to release them, I was already sensing the energy change in my stomach and being. After that ceremony I had felt some energetic and spiritual work was certainly done on the issue, and now I had to turn to the physical. Days later, I ended up coming across something called The Master Fast (not The Master Cleanse). It’s essentially a protocol where you drink about 1L of grape juice with lemon in it each day for as long as you choose to do the fast. The protocol also contains regular enemas or colonics, herbal tinctures, dry fasting, and a specific timing protocol so that your key cleansing organs are pushed to clear out, effectively allowing your body to heal more easily. I should note, if you do decide to do this fast, please do your research first. I spent about two weeks researching before starting and it makes all the difference. There are no quick fixes or magic pills; you have to be in it to win it all the way. I went on the Master Fast for 17 days, as that’s when my body instructed I was done for now. I had passed parasites, a ton of mucoid plaque, and felt incredible. After slowly easing my way back into foods, I was no longer experiencing any of the bloating, gas, or digestive issues that I had in the past. 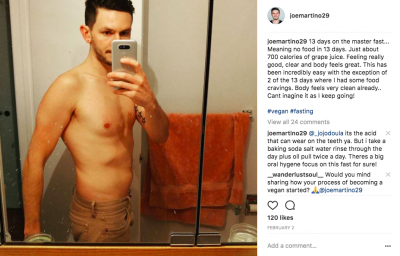 I went 17 days without food to help clean up my past digestive issues. It worked. I found this experience to be very helpful for me. Regardless of the fact that it went against my intuitive feeling that it wasn’t going to solve my issue, I still went in open to the possibility and I gained some great insight as a result. Again, I was well aware of the consequences of eating meat but felt I had tried everything I had knowledge of and nothing worked. I chose this experience as a great reminder. Seeing again what I did, firsthand, about how meat changed my body, frequency, and overall clarity, was helpful in my not only being able to share my story, but continuing on a path that I know resonates with me more deeply. We talk a lot about the physical health implications of eating meat, but we don’t often talk about the energetic or spiritual side of it. While I don’t believe in casting any judgment about this, I encourage reflection and experimentation on this, as it can be quite profound, and given what I intuitively know, learned, and saw during my experiment, I know it would be a game changer for our society if we were not ingesting this type of energy.